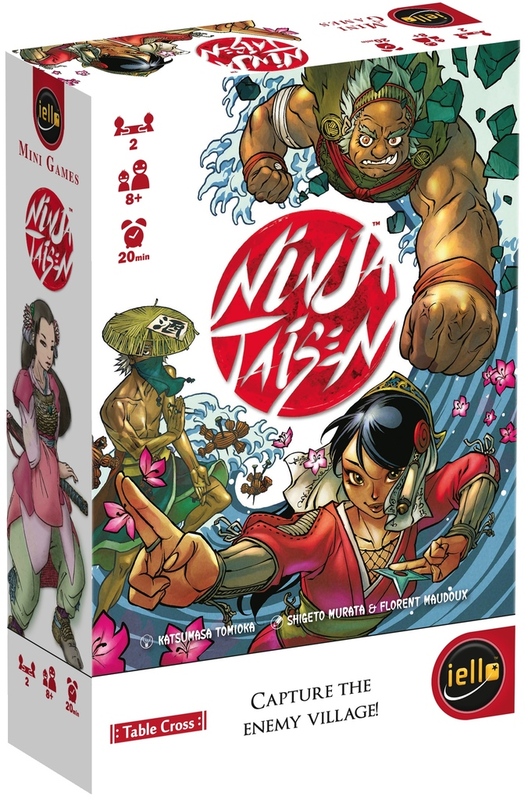 Ninja Taisen is a game by Katsumasa Tomioka, published by IELLO. It is for 2 players. In this game, players take on the role of leaders of a peaceful village that has finally reached the end of a peace treaty that lasted for hundreds of years. Their forces have been gathered and are set to invade the village of their enemy. In the end, the player that can complete their task of invasion and thus secure the village for themselves or can survive the other village’s onslaught, will be declared the winner. To begin, the Path Tiles should be placed in the middle of the play area with villages on either end and the tiles ascending in order based on the dots for one village symbol. Players choose one of the 2 villages and take the corresponding ninjas. The Shogun is placed face up below the player’s village. The remaining ninjas are shuffled and randomly placed face up in an overlapping row with 3 ninjas being added on top of the Shogun, 3 ninjas below the 1st path tile, 2 below the 2nd and 1 below the 3rd. The first player is chosen and receives the 3 dice. Play now begins. The game is played over several rounds. Each round players go back and forth, taking turns. Each turn consists of 2 phases; Ninja Movement and Combat. The first phase is the Ninja Movement phase. The player first rolls the 3 dice. They then choose a die to determine their ninja’s movement. The die color corresponds with the color of the ninja’s combat icons, while the number of the die tells how far the ninja may move. The player then chooses one of their ninjas that match the color of the chosen die. They may only choose ninjas that have 2 or less other ninjas on top of them. They then move their chosen ninja down the path towards the other village the number shown on the die. If there are other ninjas on top of their chosen ninja, they get carried along without changing the order of the cards. If the ninjas stop on a tile that already has more of their ninjas on it, they simply stack the new ninjas on top of the ones already there. The next phase is the Combat phase. If during the previous phase, a player’s ninjas stop on a tile that contains enemy ninjas on it, combat will take place until only one stack of ninjas remain. Only the ninja on the top of the stack will battle at a time. First player’s check the combat icons, if they are different, the following resolves the battle: rock beats scissors, scissors beats paper and paper beats rock. Shoguns are always considered to have the same symbol as the opposing ninja. The losing ninja is removed from the game. If the ninjas have the same icons, then the ninja with the highest strength wins. After each victory that a Shogun wins, the Shogun’s strength is temporarily reduced by the same amount as the ninja they just defeated. Again, the losing ninja is removed from the game. If both ninjas have the same combat icon and the same strength, they tie. This means that both ninjas are then forced to move one tile back towards their own villages. If ninjas are fighting on a village and they are both tied, the ninja that can’t retreat loses the fight and is removed from the game. Combat continues as long as there are still ninjas on both sides of the battlefield. Players then compare the next ninja card on top of their opposing stacks. It should be noted that in some cases, a ninja that is forced to retreat can trigger a new combat. In this instance, the combat already in progress should be resolved before resolving the new battle. Once there are no more ninjas opposing each other on the battlefield, the combat phase ends. Any Shoguns remaining on the field are then restored to their original strength of 4. Once the Ninja Movement and Combat phases have been resolved for the player’s chosen die, the phases are then repeated if the player chooses to use another unused die. The player’s turn ends once all 3 dice have been used or a player decides to stop using any more dice. The player then gives their opponent the dice and they take their turn following the same set of phases. It should be noted that on a player’s turn, they must use at least 1 die before ending their turn. The game continues with players taking turns until one of two events occurs. If all of one player’s ninjas have been eliminated, the player that still has ninjas remaining on the battlefield is the winner. A player can also win if one of their ninjas is on their enemies village at the end of their turn. This game comes with some really nice looking pieces. First off there are 3 brightly colored dice, one for each color; red, green and blue. I really like the fancy design of the numbers on the dice. It has a very distinct oriental flair to it. Next there are the path and village tiles that make up the battlefield. They are made of thick cardboard and once they’re put together they look extremely nice. You get a real nice panorama from village to village. You get a really great sense of the theme with these. Finally there are the cards; 10 for each player. The artwork is a little unusual but rather interesting in the same way. Unfortunately, the artwork on the box cover does not make it’s way inside the game. While the different ninja designs are quite nice, it is still a bit misleading. Don’t get me wrong, I’m good with the interior artwork. I’m just not as thrilled as I would have been with the box artwork having been on the cards. Also the game comes with 2 player aid cards that shows the rock, paper, scissors icons and which one beats which. All in all, I really like the theme and style of the game. I think the artwork is nice and the pieces look really great together. Not quite a homerun, but pretty darn close. The rulebook for this one is very good. There are plenty of great pictures and examples throughout the book. There’s even an example of a game turn with step by step references and pictures. All the different elements of the game are explained in really great detail, as is the set up and the rules of gameplay. Everything is extremely easy to read and understand. I couldn’t really find anything to complain about with the book. Overall the rules are laid out well and everything looks great. This is a really nice, fun, little filler game. It’s a little bit like war and a little bit like rock, paper, scissors. It even utilizes the rock, paper, scissors mechanic. Basically it’s all about positioning your ninjas in the best way based on the results of your dice roll. You really have to think about which of your ninjas will face off against your opponents. It’s a little bit strategic and you will need to keep not just the icons but also the numbers of each ninja in mind as you move them on the path. Of course sometimes, you’ll just end up with a bad roll and no matter what you do, you’re gonna lose ninjas. If I had anything negative to say about the game, it would probably be that. Bad rolls are gonna happen and with a game that has some aspects of luck involved like this one, it’s gonna happen more times than you’d care for it to. Still, the game is so fast, fun and quirky that I can’t help but like it. It’s pretty simple to play and easy enough for even younger players to enjoy. Fans of light weight card games should really enjoy this one. It’s small enough that it can be carried very easily and has a fairly small footprint on the table or whatever playing surface you play on. I definitely recommend giving this one a try. It’s a lot of fun in a small package. 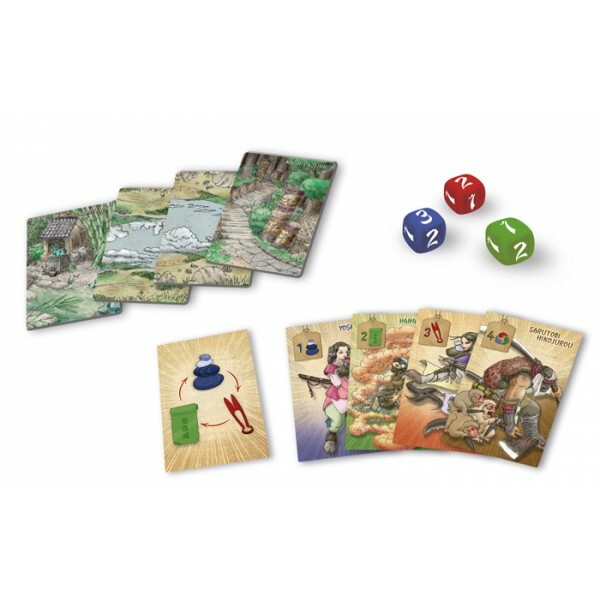 Ninja Taisen is a light weight card game that utilizes the paper, rock, scissors mechanic in a new and fun way. It’s really easy to play and doesn’t take a long time either. Most game sessions last around 15-20 minutes. It’s a great little filler that is fun for both older and younger players. It’s compact and doesn’t take up a lot of room, making it easy to take and play almost anywhere. There is a little bit of strategy to this one and it also has a bit of luck involved. Fans of light weight card games should enjoy this one. The components are really nice, however the artwork on the box doesn’t exactly match up with the cards inside. This may throw a few folks off, but it doesn’t take away from the fun of the game itself. It’s just something to be aware of. Overall, I really enjoy the fun and quirkiness of this game. It’s one that I would definitely recommend giving a try. Ready, FIGHT!